There's an urban gardening trend emerging up on our roof tops as more of us look for ways to green up our lives in the literal sense not just the energy saving, recycling and chemical free way. Mayor Boris and the chair of London Food Rosie Boycott have announced they want to provide 2,012 new green spots in London by the 2012 Olympic Games for green thumbs to grow more food. At present it takes some budding veggie growers ten years in waiting to get their gardening shovels into an allotment. The London Development Agency is funding a pilot scheme to find 50 initial spaces which will include places like unused railway yards, canal banks and reservoirs and potential roof gardens. 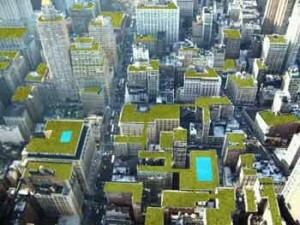 Roof gardens are a potentially brilliant force to combat climate change. If you imagine how much square space must be up on all the buildings and roofs of London and the amount of potential CO2 the plants could absorb - well, it sure could clean up a sky full of air pollution for a start! Some of the benefits of having your own roof garden include: if you grow fruit and veggies up there you get to eat them; they improve air quality in cities; they conserve energy by providing extra insulation - in the summer as well winter; they provide sound insulation; improve drainage by soaking up water and preventing waterproof roof coating from cracking when it freezes; roofs last a lot longer with green cover and it provides a home and pollination flora for our dwindling bee colonies in the UK. If you'd like to find out more on how to green your roof visit livingroofs.org who promote the benefits of planting plants up above and give you tip and strategies on how to do it well. To get you started try Rocket Gardens organic garden kits.